Easily store LiveChat data in your Triggerbe admin panel. Save chat transcripts, details of chat visitors or information how often a person visited your website. Analyze visitor behavior and find what leads to chats on your site. Take advantage of gathered data and improve your services. Triggerabee is analytical software which can tell who comes to your site and what your visitors want. Thanks to this knowledge, you can automate your marketing processes. The solution helps you make data-driven decisions and convert website traffic into sales. You can not only analyze your visitor behavior but also segment it based on various interests. Then you can engage and convert specific segments of users with personalized conversion widgets or your external tools. For example, you can put labels on visitors who have abandoned their shopping cart. Next time they visit your website, you can give them a discount, or a friendly reminder informing that they still have products in their shopping cart. To add to this, you can integrate Trigerbee with multiple 3rd party services including Mailchimp, Pipedrive or WordPress. Integrate LiveChat with Triggerbee and see how your customers behave while visiting your website. See what were they doing, which pages they visited and whether they engaged in a conversation with your agents before. Use that knowledge to target your customers with a more detailed campaign, reaching out to their exact needs. From now you can save each and every conversation conducted by your agents. Store everything in one place and easily analyze customer behavior, browsing through the list of previous conversations. Relevant details of your customers are displayed directly in the chat window so you can offer more personalized, informed service from the start. Integrate Triggerbee with LiveChat to understand what led your visitor to chat and what happened after it. 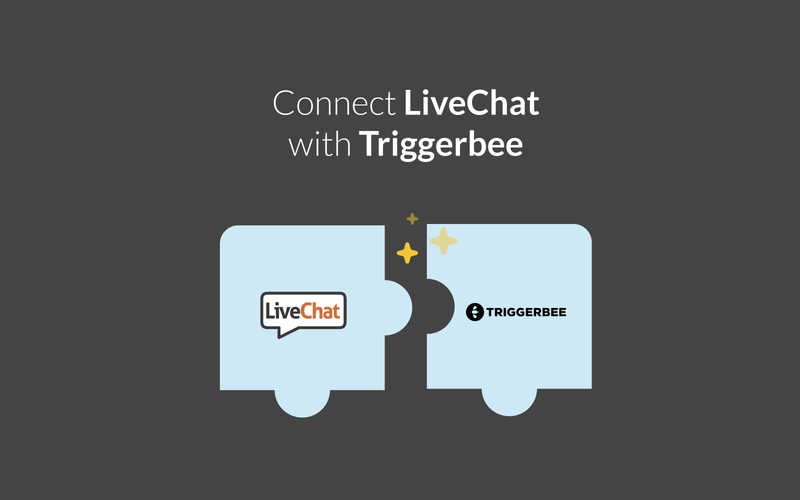 Start using LiveChat with Triggerbee now!